PRODUCT: #6 X 1-1/4 inch Bugle-Head Drywall Screw / Wood Deck Screw, Coarse Thread, #3 Phillips Drive, 500 Hour Salt Spray Dacro Finish. 8000/Box. Price/Box. (aka #106CD). 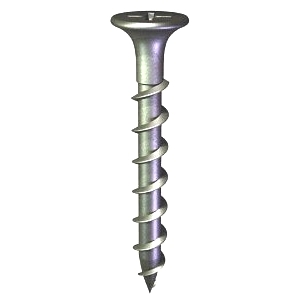 DESCRIPTION: Good general purpose wood screw for patios, decks, fencing etc. 500 Hour Salt Spray Dacro Finish.